A collection of ultra high resolution panoramas that are available for large format prints. These premium images have over 175x the resolution, clarity, and sharpness of traditional fine art images. This insanely-high resolution VAST Photo has the same clarity, sharpness, and detail, as over 175 HD TVs, allowing it to be printed in very large formats without sacrificing quality. You can even see people walking on the beach in the right of the frame. Click 'Learn More' to see what makes this such an exceptional photo. I had this shot in mind for weeks before finally finding the right conditions to head into the park before sunrise to make it happen. The early morning light is what makes the colors in this perfectly symmetrical photograph pop to the extent that they do. Click "Learn More" to explore this photo. This insanely high resolution VAST Photo is of such quality and sharpness, that you can read the advertisements on the city streets, making this photo capable of being printed to exceedingly large sizes while retaining quality. Click "Learn More" to find a size that is right for your wall. There is a magic and a glow of the high-desert in the Eastern Sierras of California that is hard to describe. It brings about a feeling in the air, and a light that is hard to replicate anywhere else. Click "Learn More" to discover how to make this feeling a part of your home. The weather on the Hawaiian island of Kauai can shift within the span of minutes, raining like a monsoon one minute, and sunny the next. From this vantage point, I was able to watch the weather progress through the lush mountains throughout the island. Click "Learn More" to see all available printing options. The Norwegian fjords are of such a scale and magnitude that it is extremely difficult to communicate with a single photo. It was only by stitching together thirteen individual images that I was able to give some sense of scale to this amazing landscape. Click "Learn More" to explore printing options. 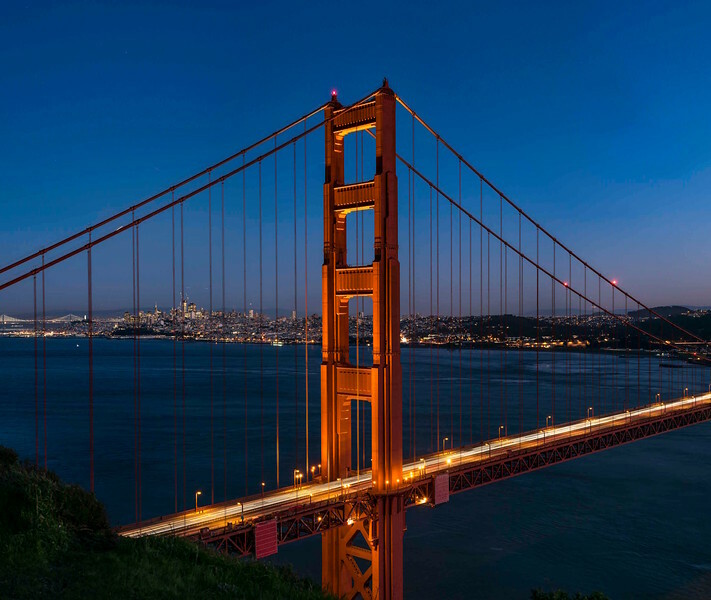 Taken from Treasure Island in the middle of the San Francisco Bay, this incredibly high resolution VAST Photo of the City By The Bay features many of its most impressive landmarks, all which can be seen in detail when printed in large format. Click "Learn More" to see!